Just a few short years after graduating from Delaware Tech, Brandon Gibbs has already made a big impact on the young minds that will shape our future. Gibbs, a 2015 elementary education graduate, began working at Morris Early Childhood Center in the Milford School District in January 2016 as a paraeducator. Barely a year later, Gibbs was notified that he was named Paraeducator of the Year for Morris, and a few months later was named Paraeducator of the Year for the entire district. 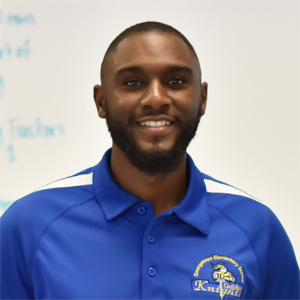 As a special education paraeducator, Gibbs assists teachers with collecting student data, working in small groups with some of the kids, managing the classroom, and helping with lunch and bus duty. At Morris, he has worked with both the pre-k and kindergarten age groups. Gibbs' interest in becoming a teacher first started with his senior project in high school. He created a project that he taught to his peers, and he really enjoyed the process of putting together a lesson plan and explaining it to others. He also worked at the Boys & Girls Club in Dagsboro and always enjoyed helping kids learn. "I thought how great it would be to teach them every day and be a positive role model for them," he said. Attending Delaware Tech was an easy decision for Gibbs. Besides being close to home, he knew that he could take advantage of the SEED (Student Excellence Equals Degree) Scholarship program and attend tuition free for two years. He also knew he could seamlessly transfer his credits after graduation. Gibbs learned many of the skills he applies to his current position during his time at Delaware Tech, including classroom management, lesson planning, and various state assessments. He said the observation hours each teacher completes at local elementary schools were invaluable. "Being able to get out and observe and work with kids and other teachers was a big motivator for me," he said. "It was great to be able to read about things in the classroom and then see them applied in person." Gibbs graduates from Wilmington University in May 2018 with his bachelor's degree in Elementary Education. After graduation, he hopes to work full time as a fourth or fifth grade teacher. "I just want to be a positive role model and share experiences with the kids," Gibbs said. "Elementary school is where they learn all of the fundamentals, so I would like to continue to have an impact on that."